Many discrete optimization problems can be formulated as either integer linear programming problems or constraint satisfaction problems. Although ILP methods appear to be more powerful, sometimes constraint programming can solve these problems more quickly. This paper describes a problem in which the difference in performance between the two approaches was particularly marked, since a solution could not be found using ILP. The problem arose in the context of organizing a “progressive party” at a yachting rally. Some yachts were to be designated hosts; the crews of the remaining yachts would then visit the hosts for six successive half-hour periods. A guest crew could not revisit the same host, and two guest crews could not meet more than once. Additional constraints were imposed by the capacities of the host yachts and the crew sizes of the guests. Integer linear programming formulations which included all the constraints resulted in very large models, and despite trying several different strategies, all attempts to find a solution failed. Constraint programming was tried instead and solved the problem very quickly, with a little manual assistance. 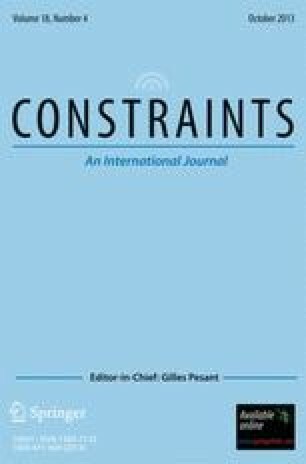 Reasons for the success of constraint programming in this problem are identified and discussed.